We’re celebrating the 45th anniversary of Apollo 17 – the final Apollo mission to send humans to the Moon, and the of special interest to PTScientists as we’re aiming to return to the same location on the Moon. 16) The space suits worn on the surface of the Moon had 26 layers of materials, designed to protect the astronauts from the extremes of temperature, and lack of breathable air on the lunar surface. 17) With three Moon walks, Gene Cernan and Harrison Schmitt clocked up 22 hours and four minutes of EVA time. 18) Gene Cernan traced his daughter’s initials “TDC” in the lunar dust on the Moon. 19) The astronauts of Apollo 17 hold the record for the largest distance traversed using the lunar roving vehicle – around 35 km. 20) During the mission, Schmitt and Cernan found orange soil on the Moon – evidence of volcanic activity. 21) Harrison ‘Jack’ Schmitt had history’s first case of extra-terrestrial “hay fever” caused by Moon dust, which came on swiftly after his first EVA on the lunar surface. 22) Gene Cernan wasn’t really happy with being called the “last man on the Moon” – in his words “I was just the most recent man on the Moon – I am not the last”. 23) Eugene Cernan’s camera is still on the Moon lens pointing out into space – he hoped that it would be collected by future astronauts and could be used to measure the effect of solar cosmic radiation. 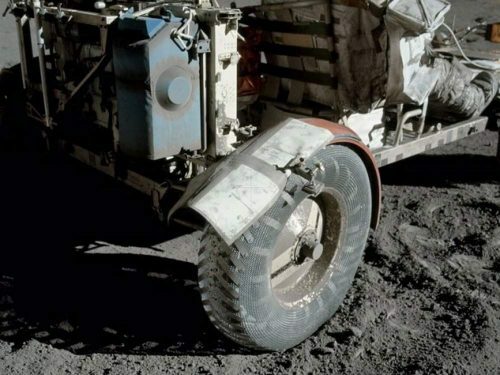 24) Part of one of the original fenders from Apollo 17’s Lunar roving vehicle remains on the Moon after reattachment with duct tape didn’t hold as long as was hoped! 25) Gene Cernan’s space suit – that he wore during his Moon walks is on display at the National Air and Space Museum in Washington DC. 26) During their traverses, the Apollo 17 crew deployed eight explosive charges which, after the crew was back in orbit, were detonated one by one to provide signals for the Lunar Seismic Profile experiment. 27) When Ronald Evans took the first steps on his spacewalk, his first words were “hot diggity dog!”. 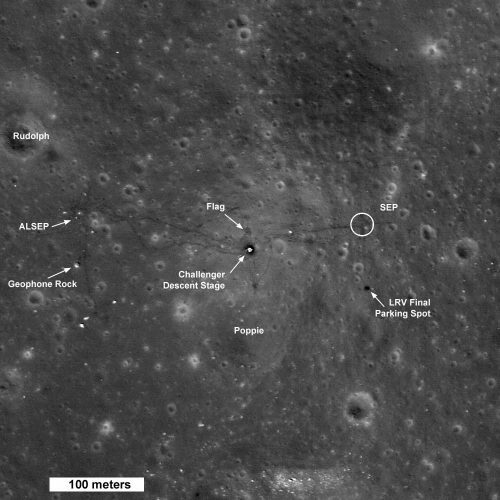 28) NASA’s Lunar Reconnaissance Orbiter took images from an altitude of 50 km above the lunar surface showing the Apollo 17 lander and rover tracks. 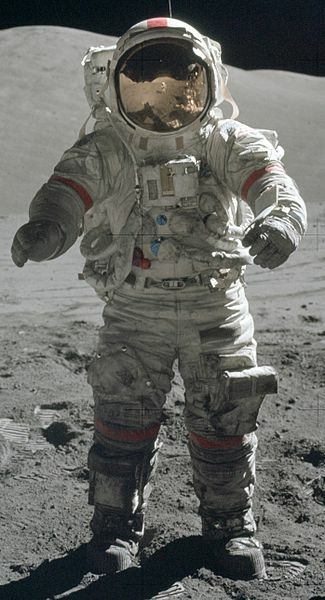 29) Harrison Schmitt’s space suit has been studied by geologists and space suit designers to find out how much damage dust from the lunar surface caused to the materials the suit was made from. 30) Gene Cernan never took a photograph of his final footstep on the Moon – something he later said he regretted. In order to bring back the maximum amount of Moon rock, astronauts left their cameras behind and only brought back the film. Gene Cernan had already left his camera behind on the surface, only realising later that he could have taken a photo of his last footprints, removed the film and thrown the camera away from the lander. Look out for the final 15 facts in our ’45 facts for 45 years’ series coming soon. You can check out the first 15 facts here.